Americans discard approximately 50 billion plastic water bottles each year. Producing that number of water bottles consumes approximately 20 billion barrels of oil and generates more than 25 million tons of greenhouse gases. In 2014, only 37 percent of non-carbonated beverage bottles made from PET were recycled. 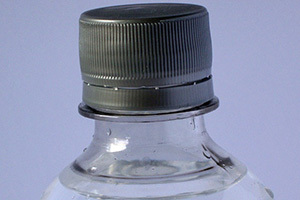 For each gallon of water that is bottled, an additional two gallons of water are used in processing. Many of these impacts can be easily avoided by switching to tap water, filters, fountains, and coolers when necessary. On average, the cost to treat, filter, and deliver water to ratepayers in the United States is 0.4 cents per gallon — roughly 2,000 times cheaper than bottled water on a per gallon basis. For the most part, this water is also very safe. Over 90 percent of U.S. municipal water systems regularly meet or exceed the EPA’s regulatory and monitoring requirements. However, a wide variety of cost-effective water filters are easily available to remove contaminants when they exist. Compared to bottled water, water fountains save money, especially when installed in easily accessible, highly visible areas such as main hallways, waiting areas, and cafeterias. Bottle-less water coolers are another smart option, drawing water from the tap and eliminating the expense of purchasing bulk bottled water. Reusable drinking water containers have low lifecycle costs and have lower human and environmental impacts than single-serve plastic bottles. Bottled water is environmentally damaging and wasteful. Given the wide availability of safe, low-cost tap water, and the wide array of appropriate and cost-competitive filters and other drinking water dispensing equipment, switching to tap water saves money and dramatically reduces environmental impacts, including greenhouse gas emissions, water consumption, and waste generation. A growing number of buyers, both public and private, are thinking outside the bottle and making the switch — providing models by which others can replicate their success. Today, more than 75 parks have eliminated the sale and distribution of bottled water as a key step in addressing the climate change and other environmental problems affecting our parks and our planet. Bottled-water-free parks are reducing their solid waste and carbon footprint, as well as teaching hundreds of millions of park visitors about the importance of opting for tap over bottled water. And a groundswell of cities, states, and educational institutions are supporting this growing movement and implementing similar policies. 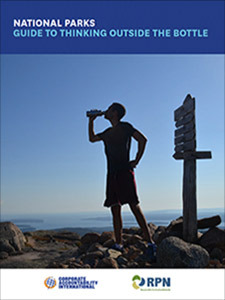 Bringing forward the best practices of bottled-water-free parks across the country, this guide, developed by Corporate Accountability International and RPN, will walk you through the process of ensuring access to public water sources in your park and phasing out the sale and distribution of bottled water. 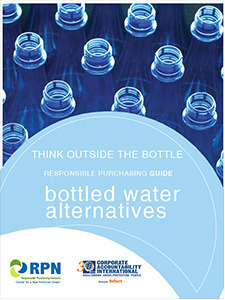 This guide serves as an update to RPN’s previous publication, Think Outside the Bottle: Bottled Water Alternatives. 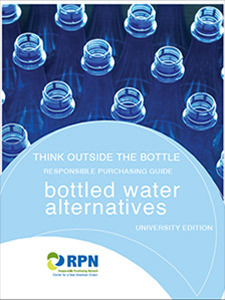 In order to facilitate the efforts of educational institutions throughout the world that are seeking to reduce or eliminate purchases of bottled water, RPN has created an updated version of its bottled water alternatives guide, tailored specifically for universities and colleges. 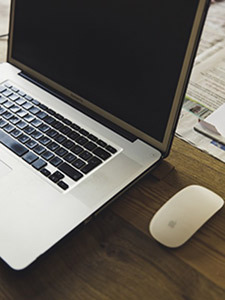 Most of the information in this guide is applicable to any institutional purchaser, but a special effort was made to address the unique concerns of colleges and universities. This guide, produced by RPN in partnership with Corporate Accountability International, is designed to equip communities, purchasers, and stakeholders with the tools they need to reduce their bottled water consumption and switch back to tap water. This webinar provides schools with all the resources they need to eliminate bottled water and transition to municipal tap water with bottled water alternatives such as filters, fountains, bottleless coolers, and reusable containers. This webinar teaches the environmental impacts of bottled water and the responsible strategies that institutions can use to reduce and replace bottled water. The discussion includes case studies from organizations that have eliminated bottled water procurement and made the switch to bottle-free alternatives.